Thank you for your enquiry on our 2019 tour to Israel. JOY! 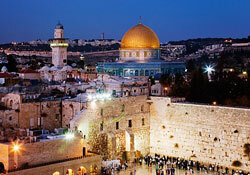 really does take the best luxury trips to Israel and everyone has a very blessed time with lifelong memories. Below and attached please find our September programme, together with a registration form. Time is certainly running out to visit the Middle East, so we encourage you to start saving now and book your place! A non-refundable deposit of R4000 pp is due upon booking and registration (to secure your air ticket). A further deposit of R3500pp is due one month later. Final payment due 25 June 2019. 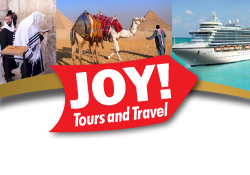 Travel with the managing editor of JOY! and meet our team. Receive Biblical teaching and have fun. WHY TAKE A JOY! TOUR? 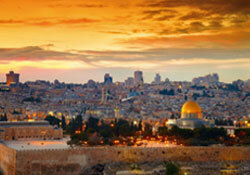 * Please note new passport rule: You must have 6 empty pages in your passport to enter Israel. * Children under 18 must travel with an unabridged birth certificate. Do call me if you have any questions; if you have any trouble with the deposit deadlines, please chat to me, as we would hate to have anyone miss out. Please note we are taking a limited amount of people. Bookings on a first come first serve basis.